This windmill and its shuttered sails are so cute you want to punch its face. 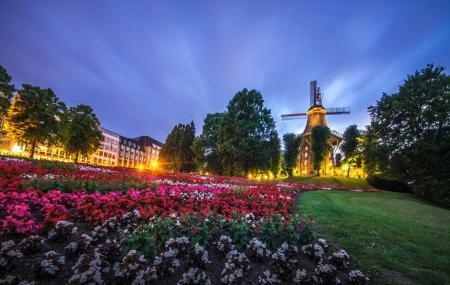 It’s the last of the eight Bremen windmills from the 17th and 18th centuries. This particular design of windmill is called a smock mill. You can check it out for a very nominal fee, and there’s a restaurant (Kainside. The paths and bright flowery gardens that surround it are a lovely place to walk. You can even spread a blanket on the beautiful grass. Call and check to see if the mill visit timings match the restaurant closing timings. How popular is Muhle Am Wall? People normally club together St. Peter's Cathedral and Burgerpark And City Forest while planning their visit to Muhle Am Wall. The menu is based around fish or weird recipies. For me as being a bit conservative when it comes to food and not a fish eater, it was a bit too much out there. That being said, the building and location have their own charm. Nice place to have nice coffee, though a little expensive. The mill and it's surroundings are really nice sight by themselves. Special Location in a great Park direct in the City of Bremen. Fresh and delicious foods and regional specials. Wonderful park, amazing view, excellent place to Photograph. Scenic cafe right under the famous Bremen windmill! Great place to enjoy a drink on a sunny day. Unfortunately service is very slow, and lacking in friendliness. The prices are also quite inflated, probably due to its prime location. As such, most of the customers here tend to be tourists.